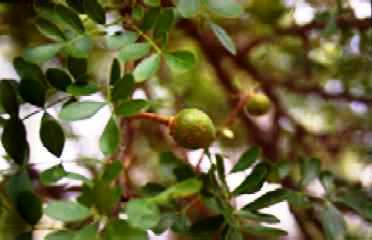 Wood apple is a native of India and Ceylon and is found through out the plains of India, particultrly in dry situations. It occurs wild or cultivated upto an elevation of 1500 ft in the Western Himalayas. It is also found elsewhere in India. A small deciduous tree with short, erect, cylindrical stem, 75-95 cm high and 60-120 cm in girth, bearing thorny branches. Leaves pinnate, 7-10 cm long, with small ovate or obovate leaflets,. Flowers polygamous in lax panicles. Fruit large, globose or oblate, 3-8 cm in dia with hard, rough, woody pericarp. Seeds numerous, small, compressed, embedded in a sweetish aromatic edible pulp. There are two types of wood apples. One has smaller fruits which taste sour. The second type has larger sweet tasting fruits. The pulp of ripe fruits is eaten as such or sometimes after mixing with sugar. A very good sherbet is also made from the pulp. The pulp is also used for making a chutney. Moisture, 69.5 g; acids, 2.3 g, protein, 7.3 g; pectin, 3-5 g; ether extract, 0.6 g; mineral matter, 1.9 g; fibre, 5.2 g; carbohydrate, 15.5 g; calcium, 0.13 g, phosphorus, 0.11 g; iron 0.6 mg; riboflavin, 170 µg and vitamin C, 2.0 mg.
Wood apple pulp forms an excellent raw material for making a jelly. The wood apple jelly resembles black currant or apple jelly in quality. It is clear, of bright purple colour with firm quivering consistency and exceedingly agreeable flavour. The tree is lopped for fodder in some parts of India. The wood is durable both under cover and exposed situations. It is used for making many articles. In Ayurveda, wood apple fruit is considered tonic, refreshing, cardiacal, astringent (when unripe), antiscorbutic and alexiformic. It is used for the treatment of diarrhea and dysentery. The pulp is used for affections of gum and throat. The tree exudes a gum from trunk and branches. This gum resembles gum Arabic in properties. The exudation is profuse after the rainy season. This gum is considered to be good substitute for gum Arabic. Ferronia gum occurs in irregular semi transparent tears varying in colour from reddish brown to pale yellow or colourless. The gum dissolves in water forming tasteless mucilage, more viscous than the gum arabic. 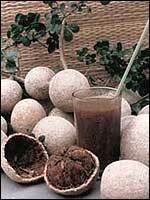 Wood apple is often planted in India on the borders of fields and as a roadside tree near villages. Sometimes a few trees are also planted in the orchards. This plant is propagated by seed. It can also be multiplied by cuttings and layering. Even budding on its own seedlings is feasible and the resultant trees are relatively of lesser height. 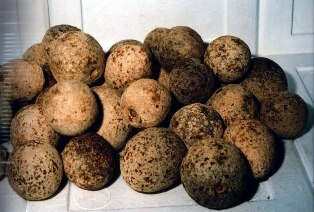 Wood apple can grow in almost every type of soil. It also does not mind minor differences in climate.